Money, work, the economy, family responsibilities, personal relationships, and health are today's top triggers of stress, according to research by the American Psychological Association. No one is immune, but luckily we all have the power to reduce the amount of stress we experience in day-to-day life. Yet research shows only 37% of Americans feel they are doing an adequate job of managing their stress. Read on for a roundup of our six favorite de-stressors that are simple, effective, and guaranteed to make you feel a little bit lighter on your feet. Stop what you're doing and take a couple slow, deep breaths. Now take a few more. This easy, ancient practice of deep breathing slows the heartbeat, relieves anxiety, lowers blood pressure, and induces a sense of peace and calm. It's the body's built-in stress regulator. Yet in our fast-paced society, conscious breathing often takes a back seat. Here's a quick refresher based on pranayama, a method of breathwork used in yoga that's proven to enhance relaxation: To start, sit in a comfortable seated position on the ground. Close your eyes and inhale deeply, filling the lungs with oxygen. As you breathe the air in, allow your stomach, back, sides, and rib cage to expand. When you're ready, exhale slowly until you've completely emptied the lungs, as if you were wringing out the air like water from a wet towel. You won't need a racket for this muscle relaxing trick. To start, lie flat your back with your gaze toward the ceiling and tuck a tennis ball under your low back, just to the left of your spine. Close your eyes, breathe, allow gravity to sink your body down, and let the ball press in to your muscle tissue. After a few moments, roll the ball an inch higher on your back, slightly to the left of your spine. Repeat this process until you've reached your shoulder area, then repeat on the right side of the body. Experts say this routine will rejuvenate muscle tissue, loosen knots, and help the body and mind relax. Here's another tennis ball trick. Poke a hole in the ball and you've made yourself a stress relief ball. Simply grip the the ball and squeeze it tight when you feel tension and anxiety building. This little hand pulsation exercise can also help lower your blood pressure. It's the perfect stress relief solution when you're on-the-go. Sure, technology has its benefits, but it's also making us sick. Literally. Stress, depression, and vision impairment are just a few of the negative consequences of spending too much time on our phones, tablets, and computers. Luckily, there's a simple fix: unplug. After work, on weekends — whenever you can. By disconnecting from email, text messaging, and social media, you can actually increase your connectivity to the people around you. And you'll feel a heck of a lot better while you're at it. It only takes 25 minutes of meditation for three consecutive days to reduce stress. It may seem daunting at first, but meditation is a practice anyone can do. The goal is to give the mind a break from its constant hustle. Here's a short how-to guide for first-timers: Concentrate on a single focus, be it your breath, a one-word mantra, or the flicker of a lit candle. Empty your mind of all other thoughts; if outside thoughts arrive, simply acknowledge them and let them go. Start with two or three minute intervals, eventually working your way up to a full 25-minute practice. The sounds of birds chirping, rain falling, and bees buzzing are proven to lower stress and evoke a feeling of calm. If you can't get outside, find a source of water indoors. The sound of running water — be it from a rolling brook, waterfall, or kitchen faucet — is scientifically proven to boost happiness and relieve tension. A brisk walk is one of the best exercises for you. And it only takes 20 minutes for your brain to start releasing endorphins and dopamine — those feel-good hormones that make you happy. Not only is walking good for the heart and lungs, it reduces fatigue and improves alertness. 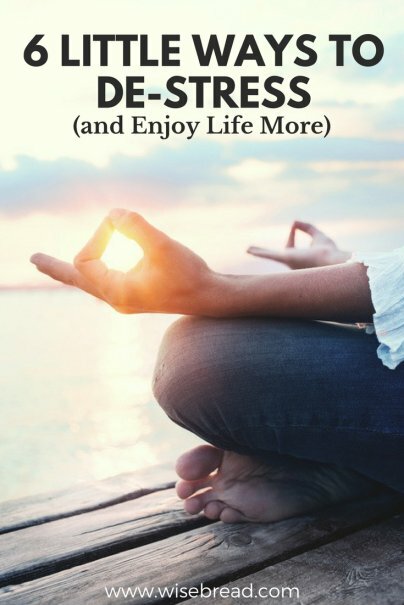 This is particularly beneficial for those among us who are stressed out, since stress can deplete the body's energy and the brain's ability to concentrate. How do you de-stress? Please share in comments!